Whether you call them hot dogs, wieners, or franks, most kids love them. It's easy to cut them into shapes that turn into an octopus once cooked. Children get a big kick out of this simple recipe. Skinless hot dogs work best, and you can choose from meat, pork, beef, chicken, turkey, and even vegetarian franks. 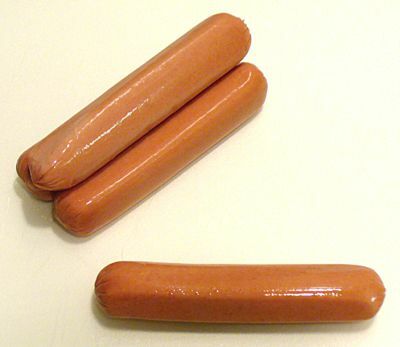 Using a sharp boning knife, slice the hot dog in half lengthwise, leaving 2 inches connected at one end. Roll the hot dog 90 degrees, and repeat, slicing lengthwise in half but leaving the 2 inches connected at one end. You should now have four legs for the octopus. Of course, an octopus has eight legs, so carefully cut each of the four hot dog legs in half. This is where a sharp boning knife is essential because the legs will be thin and fragile with some hot dogs. If you have any cutting errors and ended up losing a leg or two or the hot dog coming apart, you can chop those into pieces to add to macaroni and cheese or baked beans. Or, you could ask your child to help make up a story about why the octopus is missing a leg. That can make for mealtime fun. Place the hot dog with arms spread on a microwave-safe plate and microwave on high for 30 to 40 seconds. The arms will get curly and the head will plump. You can also cook the weiner in a steamer basket until heated through, being sure to spread out the legs before steaming. You won't have to worry about food safety as hot dogs are precooked, so undercooking isn't a problem. But you want to apply enough heat to get the legs to curl up. Serve the hot dog octopus over baked beans, easy macaroni and cheese, or scrambled eggs. It makes a fun topper for those dishes. Your child will need a knife and fork as the octopus can be a bit messy as finger food. Serve some steamed vegetables or a fresh salad so the kids get a balanced meal. 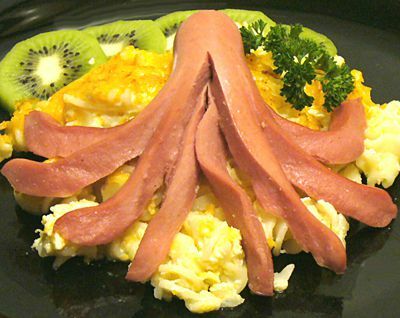 The hot dog octopus can be a way to introduce the idea of eating seafood to finicky kids. Once they've enjoyed eating hot dog "tentacles" your kids may not be as opposed to trying calamari. On the other hand, be prepared for some kids to be put off from eating a hot dog now that it appears to be a sea creature. You can quickly take the plate away, slice the hot dog into bites or strips, and serve it. Mixing it into the beans or macaroni may also allay sudden fears, or you may just have to eat it yourself. From Asian Fusion to Americana Classics - How to Throw a Hot Dog Party!